You have one spaced rep queue that everything is placed into. Flashcards are arranged in chronological blocks of yesterday, a week ago, 2 weeks, 1 month, 2 months, etc (the flashcards are randomized inside of the blocks but the blocks are ordered chronologically). 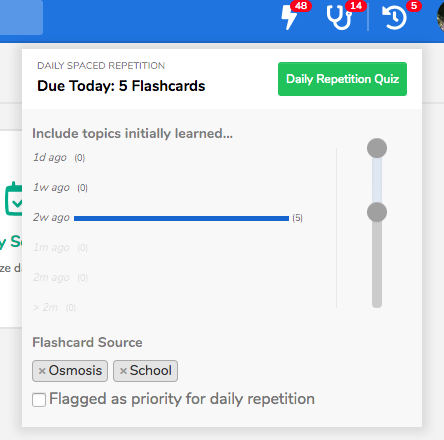 So let's say you have 150 flashcards in your queue. If you answer the first 20, you'll be answering the highest priority cards (ones you recently missed and ones that you've gotten correct but have had few repeats). As you go deeper into the deck (i.e., as you get closer to 150), you'll be going further and further into the past in terms of repetition. From the perspective of memory theory, your forgetting curve should flatten out or become more linear as you do more repeats over larger intervals of time. In other words, the cards that are deepest in the deck are far in the past but you should be less likely to forget them which means it's not critical to get through the full queue on every single day. Let's also say that on a subsequent day maybe you do get through your full queue. If there are cards in the queue that are overdue and you get them correct, you get an additional bonus in terms of when you would have to repeat them again (b/c Osmosis corrects for the fact that you successfully remembered something even though it was "overdue" and at risk of forgetting it). If you select "Do not repeat", the card is removed from your queue. The only way to get it back is to go back to that particular topic area either in the library or in the "board topics" section of Quizzes and repeat questions you answered correctly in the past. So for that reason, I'd recommend not selecting "Do not repeat" if you want to see it again. Also don't finish your queue in it's entirety each day (as you go through the queue, Osmosis will tell you when you've completed everything that was flagged in the last week for example and you can stop there if you want). That way the older cards will become overdue and you can choose (maybe once a week or so) to go through your entire queue to start catching overdue cards.